Extensive flooding and landslides have caused problems in parts of Scotland following prolonged heavy rain. In Oban, a number of low-lying areas were submerged in deep water, leaving vehicles stranded. In Wester Ross, the occupants of a car had to be rescued from flooding on the A832 Badachro junction, near Gairloch. And multiple landslips closed the A83 at the Rest and Be Thankful in Argyll, with a diversion of almost 60 miles in place. A Met Office yellow "be aware" warning for heavy rain is in force across much of western Scotland until midnight. On Tuesday evening, the Scottish Environment Protection Agency (Sepa) had four flood warnings still in force - for Strathglass, Moy Bridge, Glen Lyon and Spey Dam to Newtonmore - and a number of flood alerts. In Oban, much of the retail park on Lochavullin road has been submerged. Police were advising people to avoid Lochavullin Road and Lynn Road. A spokeswoman for Argyll and Bute Council said there were a number of low lying sections of Oban, surrounding Lochavullin, which were flooded. She said: "The standing water is caused by the exceptional amount of rain recently, augmented by higher tides than usual and the strength of the wind backing up the Black Lynn towards the flooded area. "There are pumps in the area which will cope with reasonable quantities of water but not the volume of water we have experienced over the weekend and the start of the week." The A83 at the Rest and be Thankful has been particularly prone to landslides, and work has been carried out in recent years to reduce the risk to drivers. Bear Scotland said about 2,500 tonnes of debris had been caught in the recently-installed landslip "catch fences" above the road. A spokeswoman said four of the fences had stopped the majority of material from reaching the A83, but a large boulder had damaged one of the fences and some debris had reached the A83 carriageway and the Old Military Road below. A spokeswoman said prolonged heavy rain throughout Tuesday prevented teams from safely accessing the slope to investigate the potential for any further landslips. They are now planning to access the slope above the carriageway at first light on Wednesday to carry out a full geotechnical inspection and evaluate its stability, before clear-up operations can get under way. The road operator said it was not currently safe to open the Old Military Road but it is hoped it will be opened on Wednesday afternoon. Tommy Deans, Bear Scotland's north west network manager, said: "Teams have been working hard in very challenging conditions today to try and assess the extent of the landslips affecting the Rest and Be Thankful, however, heavy rain is making it difficult for teams to assess the likelihood of any further occurrences elsewhere on the slope, with approximately 75mm (3in) of rain recorded at the Rest and Be Thankful today alone. "The specialist debris fencing has prevented the vast majority of material from reaching the roadside, however, some debris has spilled onto the carriageway below with some reaching the Old Military Road. 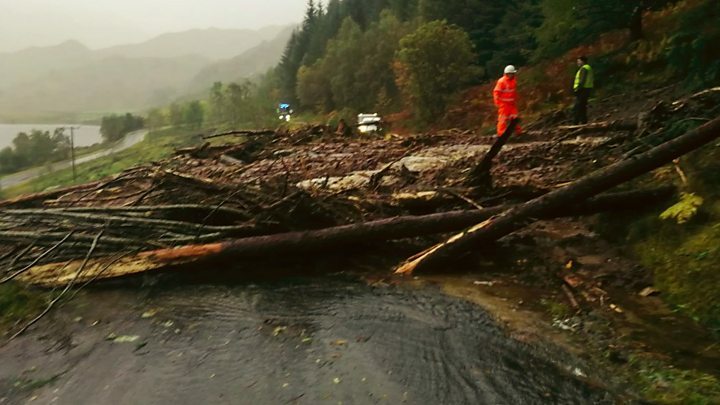 "Safety continues to be our top priority and until we are completely satisfied that no further material will come down the hillside, the A83 and Old Military Road will remain closed." He added that drivers should check Traffic Scotland for the latest information. Western Ferries have been running a four-vessel service to keep traffic moving between Argyll and Inverclyde while the road is closed. A Transport Scotland spokesman said: "We are very aware of the importance of the A83 to this region and £66m has been spent on the maintenance of this route since 2007. This includes over £9.6m towards landslide mitigation works and the local diversion route at the Rest and Be Thankful. "Work has already begun on a further £2m worth of mitigation measures, including additional roadside catch-pits, to help improve the resilience of the A83 and to help keep Argyll open for business." Donald Clark, who runs the George Hotel in Inverary and sits on the A83 task force, said any road closure had a major impact the community and local businesses. He told the BBC's Good Morning Scotland programme: "There are five troublesome gulleys in that particular stretch. I think they've pretty well completed three of them, and there's another couple in the next stage to do." According to Sepa's Floodline Scotland website, the flooding of the A832 near Gairloch was caused by a nearby river bursting its banks. Sepa said the water was above car wheel level "at least". A landslide closed the road between Glenelg and Shiel Bridge in Lochalsh. Highland Council said the road had since reopened after debris was cleared away. A spokesman said another nearby road blocked by debris from the same landslip, the Ratagan-Letterfearn road had also been cleared and reopened. The Glen Salach road (B845 Ardchattan to Barcaldine) was impassable due to a landslip. ScotRail services were disrupted between Glasgow Central and Ayr due to a tree affecting overhead wires at Elderslie in Renfrewshire. A fallen tree also damaged the overhead wires near Belshill, causing delays. CalMac said that some ferry sailings were cancelled and others were liable to disruption. Marc Becker, Sepa's duty flooding manager, said: "Rivers will remain high in areas that experienced a lot of rain yesterday but are expected to fall later in the day. "Areas likely to see difficult driving conditions and ponding of water in known trouble spots are include west central Scotland, Skye and Lochaber, Argyll and western parts of Central and Tayside. Wind debris, such as fallen leaves, may increase this risk by blocking drains." He added that high tides would peak around the whole Scottish coastline over the next few days, increasing the possibility of some isolated minor flooding to low-lying land and roads. Earlier in the day there were multiple collisions on commuter routes, including a four-car accident on the M8 westbound near junction 27 and another four-vehicle accident on the eastbound A92 near Cowdenbeath in Fife. A crash on the A85 near Dalmally, which closed the road in both directions and affected the Rest and Be Thankful diversion, has since been cleared. Forecasters said the rainfall levels were expected to be similar to those experienced during Storm Desmond in 2015. Some parts of the north west Highland are likely to receive about 200mm (8in) of rain by the end of the day.